Ladbrokes Casino has launched AceKingdom, a brand new online casino licensed by UK Gambling Commission. BetAndSkill readers can try AceKingdom Casino for free! 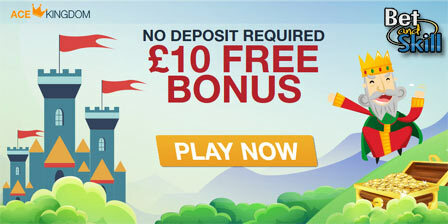 Join via our special links and get a £10 no deposit bonus right now! 3. Create a new player account using bonus code "AK10"
4. Register a valid credit card (no deposit required) and receive your free bonus within 48 hours. Bonus is valid until 2015-12-31. 5. Enjoy your free tenner playing the best Playtech games. AceKingodm casino games include the most known Slot Machine, Blackjack, Poker, Roulette and Craps. You can play on your desktop or mobile (iPhone, iPad, Android Phone and Tablet, Windows Phone). AceKingdom Casino is a new online casino and mobile casino with great games and bonuses for you to enjoy. Their Welcome Package offers new players up to £300 in Deposit Bonuses and 100 Free Spins. Join today to play your favourite Slots, Roulette and Blackjack games. 2. Bonuses are only available to customers who make a deposit/transfer/allocate funds for it. Only one bonus is awarded per person, household, shared computer or shared IP address, unless stated otherwise in the promotion offer. 3. The Wagering Requirements for all bonuses must be met within (30) days of your bonus becoming active otherwise the bonus + winnings will be removed, unless stated otherwise in the supplemental Terms & Conditions. 4. If you have yet to complete the wagering requirements of a bonus whilst having claimed for another bonus/es, you must be aware that you must complete the wagering requirements of the first bonus before starting to accumulate the wagering for any consecutive bonus/es. Please note that until your combined total balance (deposit amount + bonus amount) between your active bonus and any other pending bonus/es reaches less than £1, you will still be tied into the wagering requirements for any claimed bonus/es in your account. 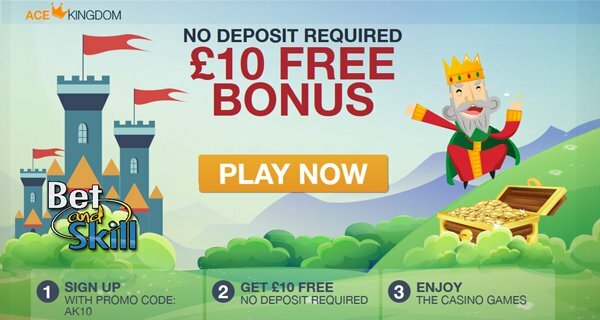 "Get £10 no deposit at AceKingdom, a brand new casino launched by Ladbrokes"